Canadian carrier Rogers has announced that the Droid Razr HD, there called the Razr HD LTE, is now available in the great northern frontier. The Canadian carrier is offering the new Motorola smartphone at $99.99 with a three-year contract, though it can also be purchased standalone for $599.99. Although the Razr HD LTE hasn't yet appeared on Rogers' website, The Verge has been assured that it's available in the carrier's physical retail locations across Canada. The Droid Razr HD's Canadian launch comes following news in September that the new Android smartphone would arrive in Germany in October as well - making the absence of a U.S. launch date all the more conspicuous. But where's the US launch? U.S. Motorola diehards are beginning to get frustrated by Verizon's refusal to commit to a launch date for the Motorola Droid Razr HD. Motorola and Verizon officially unveiled the Droid Razr HD and the Razr Maxx HD at a joint event early in September, but the carrier still hasn't announced a U.S. release date. Nothing official has been announced by either Verizon or Motorola, though an October release could certainly still happen. 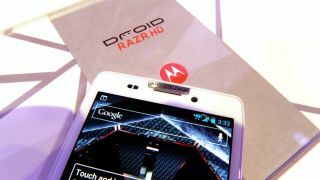 Motorola's Droid Razr HD comes packing a dual-core 1.5GHz Snapdragon S4 processor, 1.5GB of memory, and 16GB of onboard storage (with another 32GB available via microSD). It will run Android 4.0: Ice Cream Sandwich out of the box, though an upgrade to Jelly Bean is promised. The Droid Razr HD's 720p Super AMOLED display measures 4.7 inches, and, of course, LTE compatibility is guaranteed. With Canada and Germany both getting the Droid Razr HD in October, hopefully U.S. customers won't have to wait much longer.